Once upon a time, in a now-distant land called Corporate America, two friends daydreamed about opening a unique dog-focused business…someday. The topic came up several times through the years. A business plan was written…just in case. A marketing plan followed. Suddenly, someday presented itself and Pooches was born. 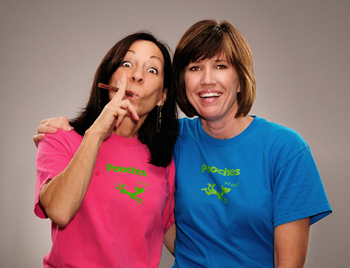 The friends are Pooches co-owners, Lawanna Smith, CPDT and Nancy Werhane, CPDT. Whoever said friends shouldn’t go into business together hasn’t met these two. Take generous doses of business know-how and marketing expertise, mix them with a healthy love for and knowledge of our canine friends and add a good dollop of humor. It all adds up to a great recipe for success. Both Lawanna and Nancy have extensive backgrounds in working with dogs on many levels. In fact, it was their beloved Dalmatians that brought the two together in the first place. In the early 90s, the two began working together in the Dalmatian Assistance League—an organization dedicated to rescuing and re-homing lost or abandoned Dalmatians—and still manage the organization today. Additionally, both women have trained and shown their own dogs in conformation, obedience and agility. A background in animal rescue combined with a love for training has lead them to pursue ongoing education in training techniques and behavior modification for companion animals. Both have also tested and earned Certified Pet Dog Trainer credentials. Their goal is to provide a full-service offering to help all dogs and owners maintain a happy, healthy relationship and lifestyle. This is the foundation of the Pooches business philosophy. 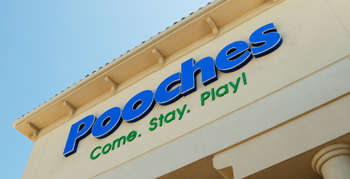 Now, with the support of a staff of talented dog-cavre professionals, Pooches has become an important fixture in Tulsa’s dog-loving community. Take a moment to learn a bit about Lawanna, Nancy and our great staff. We think you’ll see that our dedication to caring for your pooch starts with the caliber of people who work here day in and day out.